The most likely illnesses to enter our home will be viral, so I have our home fortified with antibacterial hand soap. And since we just pulled out the Christmas decorations, what a perfect time to show off Dial's adorable limited edition holiday designs. Thanks to Dial Complete Foaming Hand Wash, we have a little extra holiday cheer and the protection of a foaming hand wash that kills 99.99% of germs in and around the home. Amelia likes using the soft foam, and I love that it is gentle on hands while tough on germs. 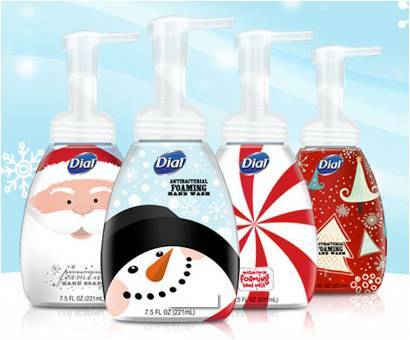 The Dial Foaming Hand Wash holiday collection features four happy designs: Santa, Snowman, Candy Cane, and Holiday Scene with fun and funky trees. Look for them on shelves today and protect your home with holiday cheer as well. Dial provided me with two bottles of their cute holiday foaming hand wash for the purposes of this review. My participation is voluntary and all opinions, as always, are my own.